When students take the time to create and curate digital portfolios, they are connecting more meaningfully to what they are learning and how they are learning it. I’ve been advocating for digital portfolio implementation on my campus, but it has been slow going. I’m hoping that a neat little feature I just added to our school’s Digital Portfolio page will encourage more students to use their digital portfolios to take ownership of their learning stories and to share their learning with others. The links that students share on that Google Form are automatically displayed on the Digital Portfolio page. I added a “Give Feedback” button, which is linked to a different, pre-filled Google Form (using an if/then statement plus some HTML in Google Sheets to add that link/button). Part of the pre-filled section includes a unique identifier (not the student’s email or ID number–for privacy). The responses from this form are collected and then the unique identifier that was pre-filled references responses from the Google Form mentioned in item 1 above. Using the Add-On formMule the feedback immediately and anonymously gets passed on to the student who owns the digital portfolio. My hope is that as students see their portfolios have an audience they will take more care to create portfolios that accurately and richly tell their learning stories. As the video above shows, I’m also hoping that a little recognition through some digital badging helps this process along. This entry was posted in Digital Portfolios, Education, Education Technology, Learning on February 11, 2018 by admin. At the rate I’m going, I hope to have these books read by Spring Break. My line of inquiry went something like this: As an educator, I’m interested in how human brains interact with ideas–with information. I loved reading Daniel Kahneman’s Thinking, Fast & Slow, which presents the human brain as something that has a habit of making all kinds of mistakes in judgement as it seeks to follow a model of reality. Thinking of the brain as some kind of faulty information processor, it made me want to investigate things that seem to process information more efficiently: computers (software, algorithms, etc.). That interest led me to many of the books that you see stacked in the image above. It feels like economic development has followed this path where humans are paid to do a thing, and then we get better at doing that thing, and then we get a machine to do that thing for us, and then we work with that machine to make even more improvements, and the desired end result is the machine is doing all the work and the machine owner is getting all the profit. This seems like how capitalism would be “solved.” I know I’m not making myself very clear here, but keep in mind I’m not an economist or a computer scientist–I’m a high school teacher librarian. But, getting back to this goal of getting machines to do things for us to maximize efficiency and profit, think of the jobs that are lost if the end goal of an industry or a vocation is to make money. If money is the morality of a field of work, is that the kind of morality that’s best for our future? Computers can trade on the stock exchange incredible numbers of shares to maximize profits. The mathematicians who help write the algorithms that trading software use are handsomely rewarded to use their skills to make… money. Ideas can be promoted and shared and liked and retweeted by bots to grab our attention for advertisers and influence how we think about a subject. The folks who create bots are often blue collar type programmers who do the work to pay the bills. The brain power spent on making such bots seems like an example of trading money for improved efficiency at concentrating attention and influence. If it’s all about money, and money keeps getting concentrated among 20% or 5% or 1% of the population, that’s what I mean when I say it seems like we’re close to “solving” capitalism. Like computers solved checkers and chess and Jeopardy!, capitalism will be solved and that’s kind of fun for the 1% who win, but what about everyone else? We spend a lot of our resources, our human capital, on solving problems related to making more money. If solving the problem doesn’t lead to making more money, then why even attempt it? Selling news that’s likely to get our attention, enrage us, or confirm our pre-existing beliefs is often more profitable than selling actual journalism. Quality early childhood education leads to incredible benefits, but we (in the US at least) make it incredibly difficult for children from poorer families to receive quality early childhood education. A large part of the problem is that we don’t pay early childhood care providers very well. Perhaps it’s perceived that there isn’t enough return on investment to adopt policies and practices that guarantee all children access to high quality early childhood education. Schools across the country have frequently elected to not employ librarians. Having such an information professional on campus is an extravagance that, apparently, doesn’t do much to boost the bottom line. Hey, nothing is stopping you from having all those things. You want early childhood education? You want quality journalism? Librarians? Pay for them. Nothing’s stopping you. The beauty of our system is we have freedom of choice–may the best forces win. The problem is, as it’s turning out, the “best” ideas seem to be those ideas that maximize profits. Maybe money shouldn’t be the endgame. This entry was posted in Artificial Intelligence, Education, Education Technology, Learning, Research on January 14, 2018 by admin. Just to be perfectly clear, this blog post is about putting student learning on display–giving your students a way to focus on demonstrating what they are learning in your classes and sharing that learning with others. I see digital portfolios as a great way to get students to rethink the degree of ownership they have when it comes to learning. School sometimes trains students to think that they have to wait for teachers to give validation of learning through test scores or point totals or grades. But we can empower students to prove what they have learned through the creation and curation of digital portfolio pages. 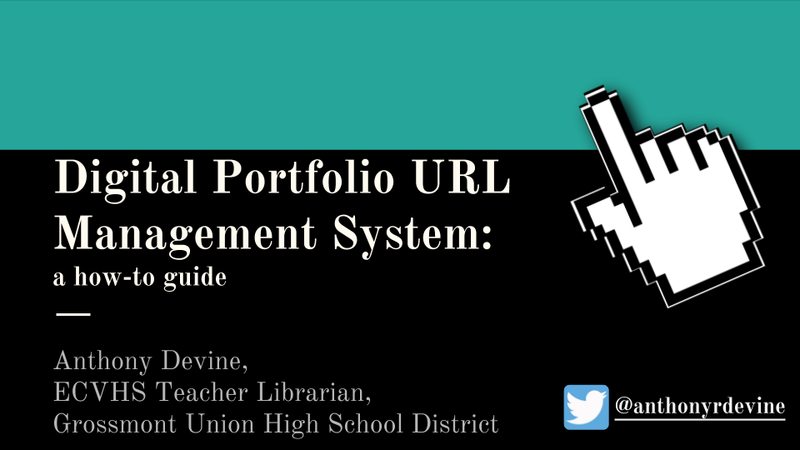 At the #SDCUETechFair last month, I enjoyed sharing some ideas on why and how to use digital portfolios. If interested, please feel free to view/share my slides from that presentation. I plan on discussing the why and how of digital portfolios in more detail in later blog posts. Now, although I have experimented with digital portfolios for years, I’ve found managing the multiple web addresses that I wanted students to submit throughout a year/semester to be a big challenge. Chasing down URLs and navigating through confusing menu structures is frustrating and time consuming. But I persisted because I truly believe that digital portfolios can put student concern and focus where it belongs: on learning, and making learning experiences better for students is one of my passions. What I’ve created is a digital portfolio URL management system, a way for teachers to collect multiple web addresses from multiple students multiple times over a semester/school year and have all those things show up on one row of a displayed spreadsheet. This way, teachers can have students submit web addresses that take the teacher (or peer, or job interviewer, or college admissions officer) directly to specific pages on their digital portfolios (pages that can contain things like demonstrations of understanding for specific projects or learning goals). So, would you like to set up a system like this for your own digital portfolio URL collection and display adventures? Great! It’s all done with Google Forms and Google Spreadsheets, with some formulas. I’ve created a couple of templates as well as detailed, step-by-step instructions for how to set up a digital portfolio URL management system like this for yourself. Click on the presentation linked below and follow the instructions closely (templates and examples are all in that presentation). You can do it! Please feel free to reach out to me with any questions or hiccups that you notice in my instructions. I really, really want this to work and enable more teachers to see digital portfolios as a way to focus student attention on demonstrating learning. This entry was posted in Digital Portfolios, Education Technology on December 14, 2016 by admin. I love the idea of having students creating pages on their digital portfolios in which they demonstrate their learning. I see each page as an opportunity to defend the thesis: “I learned X” or “I completed the X project.” I think this use of digital portfolios helps students take ownership of what they are learning when their digital portfolio pages need to demonstrate learning, rather than waiting for the teacher to tell them whether or not they learned. However, I had trouble as an English teacher matching specific pages to specific skills and projects. I would ask students to submit a URL to the page showing their X project, so I would need to make a new Google Form for each new assignment. To compound this problem, students would often submit a link to their home page, leaving me to navigate websites looking for specific pages. This workflow was frustrating, and it reminded me of the way some of my colleagues flip through stacks Interactive notebooks looking for where students put their work. Now, I wholeheartedly believe in the power of digital portfolios to amplify learning, but technology is also supposed to help make things easier–and searching through student websites to find evidence of learning was not easy. Teacher: Create a Google Form that you will use to collect a class’ digital portfolio URLs. In the settings, only accept one response per student, but allow students to edit their submission. Students will need to edit their previous form submissions as you have them build additional pages. They will come back to this form later, edit their previous response, leave the URLs in place that they submitted perviously, add URLs to new skills/projects, and resubmit the form. Put a link to this form on your website and/or in Google Classroom (I work in a district that uses the Google Suite–admittedly, this digital portfolio solution would work best in a Google Suite school). Students: Build digital portfolio pages according to teacher instructions to demonstrate understanding. Students: Turn in digital portfolio pages to the teacher by submitting URLs to specific pages on the same Google Form throughout the semester. Teacher: On the Form Responses Spreadsheet (the spreadsheet that collects the responses from your Google Form), create a new tab (new sheet) at the bottom for display purposes. 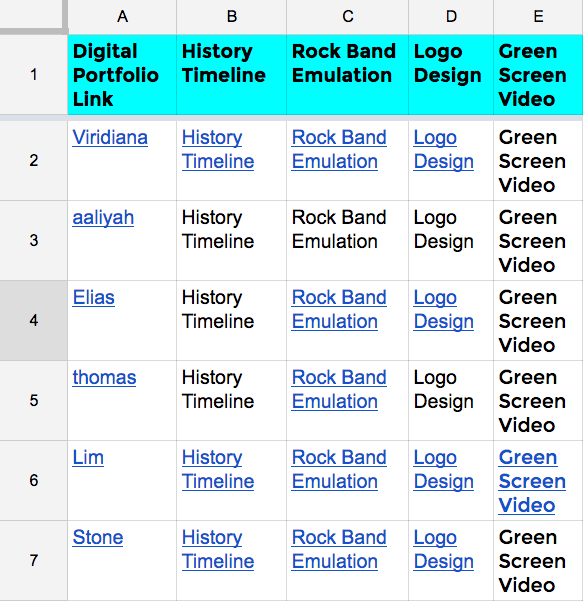 Embed this display sheet on your website (very easy to do in the new Google Sites). column D of Form Responses 1 = The student’s digital portfolio home page. D, E, F, and so on in the same fashion as columns B and C (above). Teacher: As you add more skill/project pages for students to enter on your Google Form, you will need to enter another formula to the next column over on your display sheet. You will also need to drag/copy your formulas across your entire display sheet once in a while so that students who submitted previously omitted URLs will see their links updated on your display sheet. What you end up with is a one-stop-shop taking you straight to students’ different digital portfolio pages. You can quickly and easily see who has/hasn’t submitted each page, and you can even color code the cells to provide initial feedback (a color for “great,” a color for “needs work,” etc.). It does take some work to set up, but if you’re seriously attempting to use digital portfolios as a way to assess student learning, this approach could end up saving you a lot of time and frustration in the long run. This is especially true if you teach middle school or high school and you’re dealing with well over 100 digital portfolios. Thanks very much for reading. Please share this with anyone working with digital portfolios, and please let me know if you have discovered a better solution or innovation that would achieve the same or better results! This entry was posted in Digital Portfolios, Education Technology on November 1, 2016 by admin.